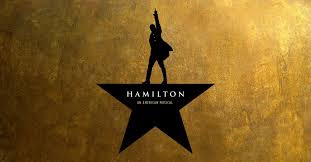 I first heard about the musical Hamilton from (where else) NPR. It was featured on their music podcast All Things Considered. Since then, the soundtrack has become a favorite on car rides. Yes, I enjoy it. But it's my kids who insist on listening to Hamilton over and over again. It got to the point where I looked in to getting tickets. But $$$$$$$. Yea sure, I'm cheap. But come on! And good luck getting tickets. That said, Studio 360 just ran a piece about one dedicated son's struggle to procure tickets for his mother. This involved waking up in the middle of the night and waiting in a line for "house seats." Basically, if members of the cast or crew declines some seats, they open these seats to the public. The problem is that no one ever knows how many tickets will be available. So everyone in line is gambling that there might be a ticket for them. If you do find yourself standing in this line, though, I recommend listening to the latest episode from Backstory Radio, which is suitably Hamilton-centric. Among the highlights, they recount a 1943 show called The Patriots. While equally as popular as Hamilton in its time, it was Jefferson who was the heroic character in the show. Hamilton, meanwhile, was his detestable foil. From this, we discover that generations tend to switch between favoring Jefferson or Hamilton (never both), identifying with one and demonizing the other. Hamilton's rise now might seem odd given the economic meltdown and everything that has followed. But the musical foregrounds Hamilton's immigrant story, his underdog rise to prominence. Backstory also features students and teachers who have brought Hamilton into the classroom. I am entirely aware that specialists of this era have many, many issues with the musical. But if this segment is any indication, Hamilton is also prompting people to take a deeper dive into the history. I'm not sure that this means that all is balanced out. But it's something--which I hear is better than nothing. So check it out and see what you think. As always, Backstory never ceases to impress me. One of these days, I'll figure out a way of getting a religious studies version of this outstanding history show.